Founded in 1974 to translate and publish the original 17th-century Dutch documents of New Netherland, the New Netherland Project provided the foundation for the New Netherland Research Center through its unprecedented and historic research accomplishments and its access to historically significant resources. Originally created under the sponsorship of the New York State Library and the Holland Society of New York, the New Netherland Project functioned with grant support from the National Endowment for the Humanities. The Project was one of the most ambitious translation projects ever conceived. Peter A. Douglas recounts the story of the New Netherland Project in Dutch Renaissance: The Story of the New Netherland Project. Now, with 6,840 pages translated to date (December 2013), the New Netherland Research Center continues to provide groundbreaking insight into the colony of New Netherland and the Dutch in colonial America and gained international acclaim as the inspiration and foundation of Russell Shorto's 2004 bestseller, The Island at the Center of the World. 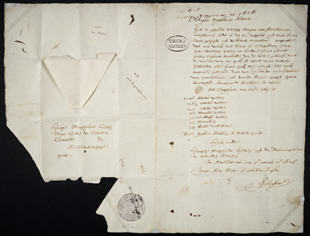 Facsimile of a 1627 letter from Pieter Schaghen that mentions the purchase of Manhattes (Manhattan) for 60 guilders. archaeological collections from New Amsterdam (present-day New York City) and Beverwijck (present-day Albany). For a quarter of a century, the New Netherland Institute , a non-profit organization dedicated to fund raising for and performing activities that support and relate to the New Netherland Project and the New Netherland Research Center. For years, the New Netherland Institute has fielded requests from teachers, students, and other interested readers for a concise history of the former Dutch colony in North America. In response to popular interest, the NNI's trustees commissioned Firth Fabend to write the immensely enjoyable and readable New Netherland in a Nutshell.